The year is 2509 and Earth is a rather polluted blue dot that suffers from global warming, overpopulation and not enough people using deodorant. Blake Carter, star agent with the Planetary Bureau of Investigation, is having a bad day that spirals out of control when the world is held to ransom by his nemesis, evil genius Bartholomew Badde. Fans of Terry Pratchett and Douglas Adams will love this interplanetary adventure from Darrell Pitt, author of the Jack Mason Adventures. 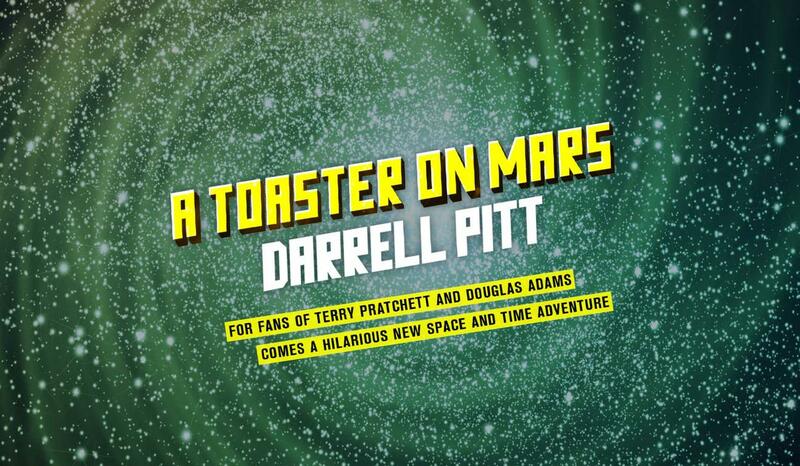 Enjoy this extract from the hilarious new A Toaster on Mars. I’m Zeeb Blatsnart. Yes, that Zeeb Blatsnart. No doubt you know me from my appearances on the Interplanetary Nature Channel—Prodding Exotic Creatures, The Glecks of Totalis Four and The Rhinorats of Sirius. There are few corners of the galaxy to which I have not travelled, and little I have not seen with my five eyes. Some may consider me a know-it-all, but I prefer to think of myself as being better informed than anyone else in the universe. I’ve been asked to edit this adventure about Blake Carter, a law-enforcement agent living on Earth. Oh, you haven’t heard of Earth? I’m not surprised. It’s a rather polluted blue dot suffering from global warming, overpopulation and not enough people using deodorant. First, I should make clear that at no point in this story does a toaster appear on the planet Mars. Nor on Jupiter, Venus, Mercury or any other planet local to Earth. There isn’t even a toaster in any nearby star system, although there is a waffle maker on Rygil Five and a rather nice casserole dish on Xypod Nine, but these culinary devices have nothing to do with our story. Some may see my editing of this book as a demotion, but nothing could be further from the truth. It is true: I was recently suspended from the Interplanetary Nature Channel for killing Tosho Twelve’s last rhinopig—but there were extenuating circumstances. I hadn’t eaten all day! And what would you rather have: a happy celebrity or a live rhinopig? I will return to the Interplanetary Nature Channel. It’s just taking some time to renegotiate my contracts. Meanwhile, I have chosen to earn a few trifling credits as an editor. I should also point out that reading this book prior to the 26th century is breaking the law. The penalty for such a crime is nine years in jail and 300 hours of listening to The Greatest Hits of Looloo Jones and his Singing Dachshund Quartet. So don’t blame me if the Time Police come bursting through your door and drag you kicking and screaming into an inter-dimensional black hole. Oh, and for a limited time only, the first ninety-seven seasons of my program, The Tarbils of Sataris, are available as a boxed set. Ring 555-334-455-663-322-441-0107 within sixty seconds to receive a complimentary slice of rhinopig. Groaning, Blake Carter peered at the owl-shaped alarm clock. He hated everything about that clock—its leer, its bright mustard-yellow eyes—but most of all he hated its voice; it sounded too much like his mother. The night before, Blake had drunk not one but eight or nine too many Plutonium Supernovas at the Pink Hyperdrive, his local bar. Afterwards he had still been able to walk, but not in a straight line. Blake’s eyes swept towards the window. His apartment, wedged between two buildings, looked over a narrow slice of Neo City. Last night he’d forgotten to turn on the blind and now he could see space elevators rising into orbit, lines of flying cars and an advertising blimp flashing on and off. Star Trek 159: The Wrath of Khan’s Clone! ‘Just give me a minute,’ Blake said. This got Blake out of bed. The alarm had once woken him with a version of ‘Dancing Queen’, sung in Icelandic and badly out of tune. Blake’s ears had rung all day. Whatever Blake had broken would forever remain a mystery as the clock died with a gasp. Blake’s home was four-metres square, with a sonarshower in one corner and a kitchen nook in another. Blake liked his humble abode, although his ex-wife, Astrid, had once described the style as a cross between early ugly and eternal damnation. Blake lurched across the room and hit the switch for his coffee pot. He wasn’t a fan of technology. Once upon a time, people had hunted, gathered and worn animal skins. 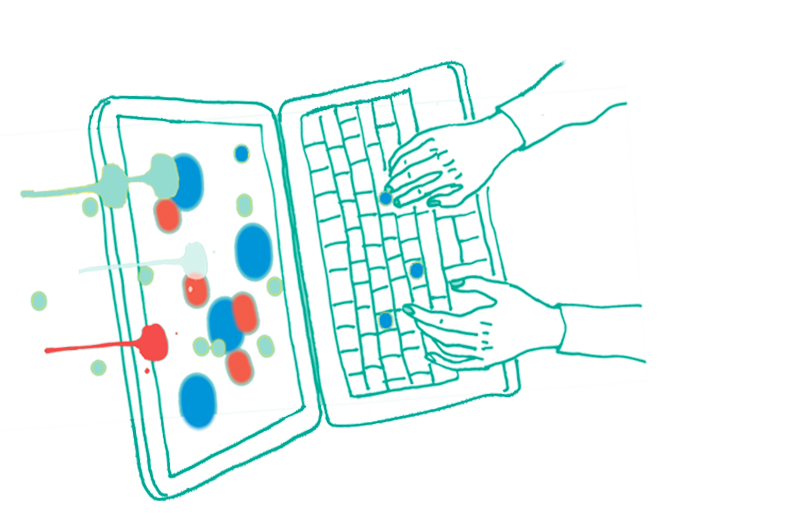 It was a system that worked—apart from the small risk of being eaten by sabre-tooth tigers. Everything these days ran on fission power, resembled something it shouldn’t and was always looking for an argument. His attack on the clock had knocked a few books off his shelf. Real books. Not plastic or electronic or those Immersion Books where you were part of the story. These were actually made of paper. Now that Blake was up, the bed had automatically folded back into the wall, revealing his wardrobe. His clothes were all identical: seven pairs of cobalt blue pants, seven amber-coloured shirts and seven long trench coats. Blake didn’t like variety. A flat-screen television and family vids decorated the other walls. Most of the vids were of happier times with Astrid and their daughter, Lisa—a week at the Lunar Zoo, the holiday on Titan and their day at the Wet’n’Wild park at the bottom of the Mariana Trench. His heart gave a lurch when he thought of Lisa. She was the one thing Blake missed about his marriage. He still carried a souvenir with him wherever he went—a tube of water from their holiday on the ocean floor. Lisa had bought it for him. On the side was a slogan, How Deep Is Your Love? Sighing, Blake caught sight of himself in the mirror. He was ten pounds overweight, his hair was starting to thin and he had deep lines under his eyes. His knees weren’t in great shape and his back ached when it got cold. Nobody lives forever, he thought. Except maybe Pleck Wilson. I should point out that there’s some debate about whether Pleck Wilson is actually alive. The film and amusement-park mogul died in 2066 and had his head cryogenically frozen. Two hundred years later, advanced technology meant the head could be brought back to life. But after being taken on a day tour of Earth, Wilson asked to be put back into cold storage. They were trying to look horrified, but it was clear they were barely able to contain their glee at breaking such a huge story. ‘Off,’ Blake told the television and it sputtered back to silence. After thirty-eight seconds in the sonar shower, Blake emerged clean, and feeling almost human. A minute later he was dressed. As an agent with the Planetary Bureau of Investigation, Blake was used to receiving calls at all hours. With branches in every city on Earth, the PBI’s role was to investigate crimes too big for the local authorities. But dispatch had already disconnected. Must be something big, Blake thought. There hasn’t been a briefing that early since the assassination of Kennedy’s clone. On the top ledge of his bookshelf sat his hat—a scarlet fedora. Blake took it down and put it on. He and this hat had been through a lot. Blake took out a bottle of pink pills. On the side it read Bacon and Eggs. He shook two into his hand. ‘Watch your weight,’ his fridge said. Rolling his eyes, Blake ate them, grabbed a second bottle and stuffed them into his pocket. Robots were everywhere. The League of Planets Charter forbade them resembling sentient life forms, including humans, but most were bipedal, with two arms, a torso and head. Many others had one leg, three legs, four legs—or more. Some even glided. The hallway outside his apartment was a cramped, gloomy corridor shared by a hundred other residents, most of them off-worlders. A family from Baxhill Six—a small marsupial race—shoved past without speaking to Blake. He’d been on their bad side since they first moved in, after chasing them with a chair, thinking they were mutant rats. No amount of apologising had mended the rift. Some species just aren’t forgiving. The day outside was humid and gloomy, the air thick with smog—but this passed for sunny in Neo City. You know those communities where public transport is efficient, pollution is kept to a minimum and people work together for peace and harmony? Well, Neo City isn’t one of them. It’s a multilayered metropolis with buildings a thousand storeys high, linked by a million walkways and roads. Sunlight permeates the upper levels, but it’s artificial light most of the way down, with complete darkness at the bottom. People and ‘things’ live down there, but mostly the things have the upper hand. Don’t go to the bottom, not even on a dare. Neo City was built on what used to be the east coast of an obsolete country called the United States. Buried under five centuries of construction is a mouldy green statue of a lady with a torch and a book. There’s also a pretty nice building that used to be called the White House—but now it’s mostly brown, held together with Wonder-Glue and occupied by a homeless guy named Ernie who lives there with his six-legged rat, Felix. Blake sighed. He lived on the 701st level, on the east side of town. There were better places to live, but a PBI agent didn’t make enough money to live in them. He joined the crowded footpath. A man passed by wearing a T-shirt with bright words flashing Don’t Buy Stuff! Following him came a woman walking a pair of Labrador-giraffes, and then a girl zoomed past on a tricycle-copter with a choir of dolls singing Beethoven’s ‘Ode to Joy’ in a basket. Robots were everywhere. The League of Planets Charter forbade them resembling sentient life forms, including humans, but most were bipedal, with two arms, a torso and head. Many others had one leg, three legs, four legs—or more. Some even glided. They were every colour imaginable and made of plexy-plastic or hydro-metal, and all were equipped with AI brains, their intelligence ranging from that of a goldfish to an Einstein, Hawking or Slugmeyer. Blake gazed about the street. Advertisements pulsated and gyrated on walls and windows, selling everything from diapers to holidays on the moon. This part of town had every building style imaginable: Art Deco, Greek Aluminium, Romanesque and Platinum Gothic, Rubber Classical, Tin Byzantium. Most of the apartments had small balconies with flowerboxes of balloon azaleas, which were all the rage this year. Endless lines of flying cars, buses, taxi-gondolas and helium-cyclists moved around the city. Another advertising blimp floated past promoting Al’s Doughnut Burgers: Lo Cal Centres! Teenagers on skateboards jumped off walkways, dropped a dozen floors and activated rockets to land safely below. Blake took a deep breath, inhaling something that tasted like a cross between burnt plastic and toffee apple. Neo City, he thought. Home, sweet home. A Toaster on Mars is available online or at your favourite bookshop.